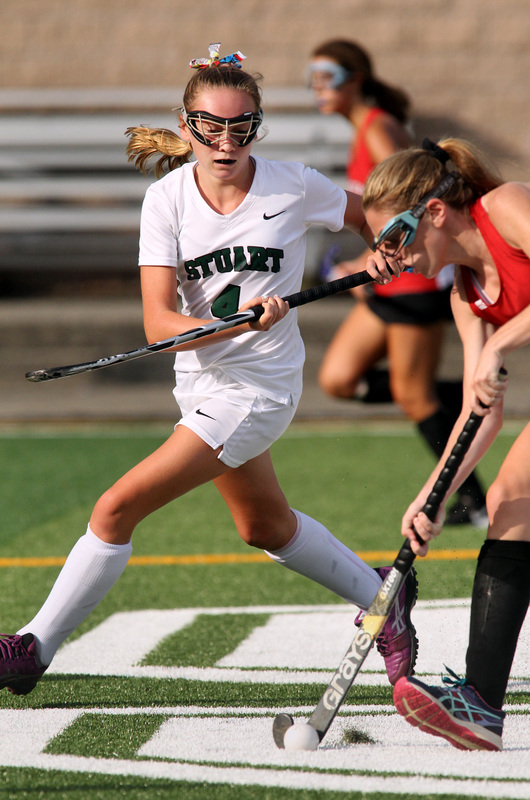 Caroline Mullen and her teammates on the Stuart Country Day School field hockey team were determined to start the season on a high note as they hosted Burlington City High last Wednesday in their opener. “I think we wanted to come out with a lot of intensity,” said junior midfielder and co-captain Mullen. The Tartans didn’t waste any time displaying that intensity, controlling possession from the opening whistle, tallying two goals in the first four minutes on the way to a 5-0 win. In reflecting on her role, Mullen is looking to be a playmaker while picking her spots for shots. “We have strong forwards and a strong freshman class that came in so it is hanging out at the top of the circle, trying to get some shots off here and there and looking to find the forward players,” said Mullen. Mullen is looking to be someone the freshmen can rely on in the midfield unit. Stuart head coach Missy Bruvik likes the improvement she has seen from Mullen as a player and a leader. “Caroline sees the field; she is the playmaker and she sets everybody up,” said Bruvik. Against Burlington City, Stuart was all over the field, dominating play as it built a 4-0 lead by halftime. Sophomore Catherine Martin executed well in the circle, scoring two goals in the win. “Priscilla has a whole new role because she played on the forward line last year and we have got her controlling the center backfield this year,” said Bruvik. In Bruvik’s view, her team’s performance in the opener was a very good first step. Mullen, for her part, knows that the Tartans face a rough road as they take on rivals Pennington and PDS. “We are going to try to focus more on the little things and refining our skills so we will be ready for them,” said Mullen.